The meeting was held in the building of the Mejlis of the Crimean Tatar People in Kyiv. 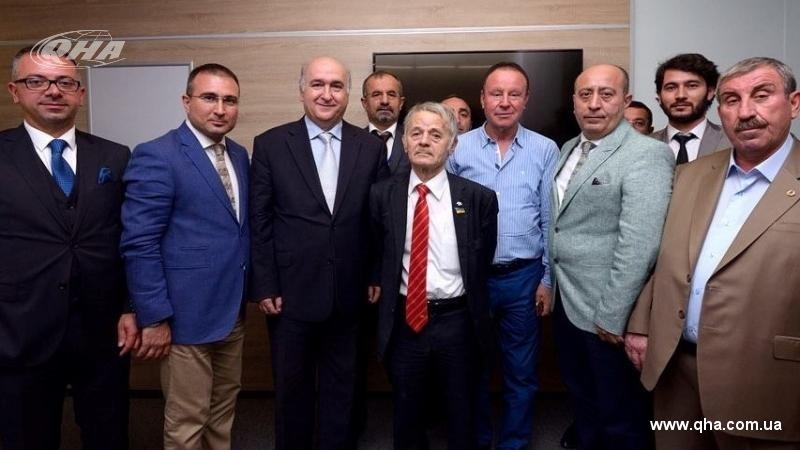 On July 10, representatives of the Turkish business sector met with the Commissioner of the President of Ukraine for the Affairs of Crimean Tatars, People's Deputy of the Verkhovna Rada, the leader of the Crimean Tatar People, Mustafa Dzhemilev in Kyiv. The Adviser to the Chairman of the Mejlis of the Crimean Tatar People Ismet Yuksel also attended the meeting. The Turkish delegation included 30 representatives of business from different cities of Turkey. They visited the International Turkish-Ukrainian Businessmen Association (TUID) and the Turkish Embassy in Ukraine. The guests will meet with Ukrainian businessmen in the Ukrainian Chamber of Commerce and Industry on the occasion of the visit of Turkish Minister of Economy Nihat Zeybekci on July 11. One of the main aims of the visit to Ukraine is strengthening economic relations between Kyiv and Ankara, according to the Chairman of the Eurasia Economic Relations Association (EkoAvrasya) Hikmet Ehren. Ukraine remains an important partner with great potential and opportunities for Turkey. The issue of investment will be discussed at the Ukrainian Chamber of Commerce and Industry. Despite difficult times in Ukraine, developing of economic and political relations with Turkey is important and relevant, Mustafa Dzhemilev stressed. Mr. Dzhemilev also told about the situation in the temporarily occupied Crimea, about the violation of human rights by Russian invaders, about missing persons, dead and arrested Crimean Tatars. He stressed that the sanctions should continue its action against Moscow. Despite the normalization of Turkish-Russian relations, Turkey does not recognize the annexation of the Crimea and will support the territorial integrity and independence of Ukraine, Turkish businessmen reminded once again.